digit is a living work of art - a writer sits at a table writing a text. the printed text appears through the mere gliding of his finger across a blank sheet of paper. spectators can come very close to the writer and follow the emerging text. the writer remains absorbed in his task. 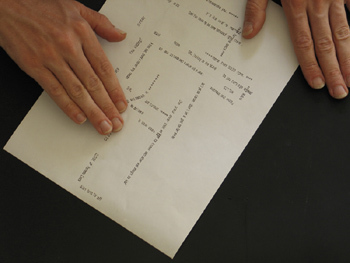 digit is located between cinematographic process and the process of writing, while also making reference to the surrealist tradition of cutting and rearranging texts. digit is what william s. burroughs called a 'soft machine'. c. bauder & r. henke: performance for a matrix of 64 gas balloons, light and sound. in a dark room filled with deep, mutating sounds, glowing spheres float like the atoms of a complex molecule. the spheres move slowly back and forth. the varying position and illumination of each atom creates a dynamic sculpture, which represents digital information in space. change becomes sound, becomes rhythm and movement. the installation consists of 64 floating helium balloons and a multi-channel sound system. the height of each balloon can be individually positioned with a cable winch. in addition, each balloon is illuminated from within and can be continually dimmed. 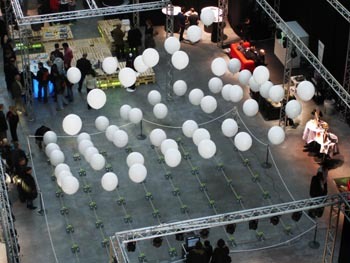 the balloons are arranged in an 8 x 8 matrix, creating a floating display in the room. both the individual heights of the balloons and the brightness of the lighting can be independently controlled by a computer. a second, interlinked computer produces the sound simultaneously. for this edition of their yearly performing music, the maulwerker will present music whose composition exists only as a structure, and whose performance is, therefore, determined by the interpreters. elements which come into play include the interplay between interpreter and work, group processes, self-organizing music, game pieces, and the process of the concert itself. a project of the maulwerker in cooperation with tesla im podewils'schen palais, supported by the initiative neue musik berlin (inm) and konzert des deutschen musikrats. with the project le vol (french: the theft, the flight), annette krebs and steffi weismann approach the question of ownership from an unusual perspective. in a three-part live performance, using sound, image, and text elements, they construct an intermedia work which covers a spectrum of subjects ranging from department store theft, through a comic fragment with flying objects, to the treatment of spiritual ownership. for the first and only time in berlin: a second life mega-event by and with jo fabian and his guests. 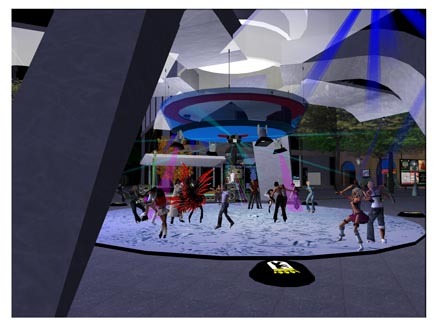 after two turbulent tesla salons about second life in may and june, jo fabian moves to the kubus and zooms the avatar cosmos into first life format. no longer in front of and on individual 17''- screens, but rather out in the open, in the middle of the real berlin. practically unter the television tower, first and second life meet eye-to-eye and intermingle. friday evening lifts off with highly informative visits between the two worlds. we tune into various concerts and land in virtual clubs. the second evening heightens into a spectacular open-ended party until early sunday morning.